We specialize in Hard Drive Recovery. Catastrophic data loss is often caused by a physical hard drive crash, and our data recovery engineers focus their ongoing R&D efforts on improving the hard disk data recovery process. Any clicking or strange noises from a hard drive could indicate a physical hard drive crash, and you should IMMEDIATELY stop any further recovery attempts. A hard drive run in a degraded or damaged state only makes the situation worse, often leading to platter damage and risking making recovery impossible. If you have a hard drive in need of physical recovery, request an Online Data Recovery Quote or call 866-438-6932 to get your free quote over the phone. 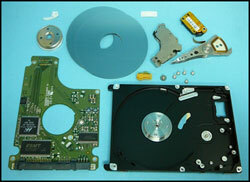 Do You Need Hard Drive Recovery Service? You might know exactly what happened to the hard drive holding your important data. If you dropped your external hard drive or laptop, and it’s now inaccessible, you know just what caused the problem. If you hear clicking or grinding sounds, or if your hard drive isn’t spinning up at all, you know without question that you’re dealing with a physical hard drive failure – something has directly damaged the drive itself. At this point, you should immediately power down the hard drive to avoid further damage, and call a data recovery company (naturally, we recommend DTI Data). At other times, you may have lost access to your data without knowing exactly why. Here, we’ve provided some pointers that might help you to get access to seemingly lost data. If your drive shows any of these symptoms, we strongly discourage trying to use hard drive recovery software. Attempts to access or back up a physically damaged drive can actually exacerbate the damage, possibly making it even harder, more expensive, or maybe even impossible to recover your data. Instead, power down your disk and send the disk to a data recovery company. Fill out an online quote form to find out how DTI Data can rescue your lost information. By contrast to the physical problems outlined above, sometimes your data may be inaccessible due to software issues, file system problems, or human error – all falling under what we call “logical” disk problems. If your data has been accidentally deleted, formatted over, or corrupted by a virus, disk data recovery software may enable you to get at your data without resorting to a full-scale data recovery process. There is even free software that can recover some data without costing you a dime. Our Resource Center offers a variety of tutorials to guide you through the process of data recovery using this and similar software. Obviously, recovery software is not the best solution for everyone. It can be a complicated process, and if you misdiagnose a physical failure as logical, recovery software may further damage your drive and reduce your chances of recovering your data. To make absolute sure you're not taking any unnecessary risk with your data, you can call DTI Data at 1-866-438-6932. Or you can fill out an online quote form and get some ideas about how we can help recover your data.